The Everest region is one of those unique and fabulous destinations in Nepal, trekkers and mountaineers delight in their travails to this region. It offers a fascinating and enjoyable environment. 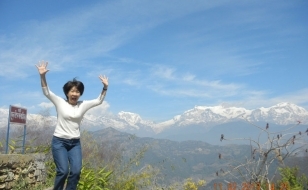 This trek begins with a scenic flight to Hillary’s Lukla. It passes through many traditional farming villages, with beautiful views of the highest snow-capped peaks in the world, and continues on to Kalapathar, the highest point of the trek, for a breathtaking panorama of peaks and glaciers, including Mt. Everest, which seems only a stone’s throw from where Kalapathar is. 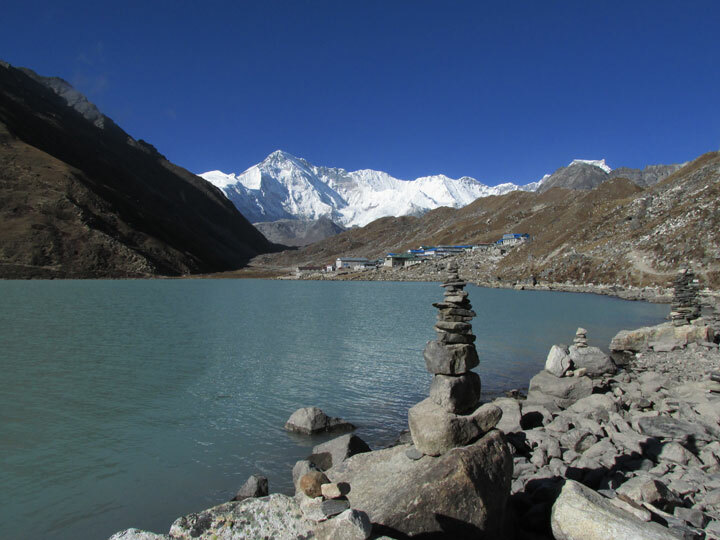 Everest Base Camp has been designed to be supple, enabling you to enjoy and immerse yourself in the magnificent natural surroundings of this fantastic area, at your pace. The trip includes all the highlights of Sagarmatha National Park, including Namche Bazaar, Khumbu, which is the Sherpa capital, an unmatched view from Kalapathar (5,545 m.), and the ever-exciting Everest Base Camp, which is an extraordinary viewpoint for Nuptse, Everest, and Lhotse. This trek gives sufficient time and opportunity to visit Buddhist monasteries, both at Khumjung, one of the oldest in the area, and at Thyangboche, one of the newest, as it was rebuilt after being burned to the ground. All along this part of the trail, villages are interspersed with wonderful forests of rhododendron, magnolia and giant firs. In both the early autumn and late spring, the flowers on this portion of the trek make it the kind of walk you will remember for a long, long time. 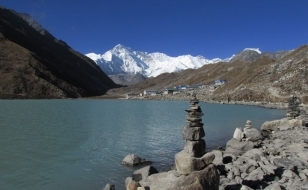 Trekking in the Everest region does not need tremendous logistics in terms of accommodation as you will find plenty of clean and friendly lodges along the trail. We stay in single rooms where possible, but often you will have to share. Facilities in tea houses are limited but good enough to offer you a comfortable stay and hygienic meals. A few have electric lights and all have a spacious dining room-lounge. We will accommodate you and your group in local lodge available each day. We send a porter ahead of us to book the required rooms for the group (rooms cannot be booked in advance). Please remember that some of them are very basic and a sense of adventure is the order of the day. We have a pool of hotels in Kathmandu under 3 Star categories which we provide to clients in connection to this itinerary, unless it is mentioned otherwise or clients have a special choice. You can check on the description of such hotels through our website. On this trek we provide standard breakfast, lunch and three course dinner, tea or coffee will also be included with each meal. Your guide will help with menu selection and ensure that you get the best value meals possible. Although the food is usually plentiful and delicious, you should be aware that the menu is not normally extensive. Most teahouses offer a variety of rice and noodle dishes, as well as soup and seasonal vegetables. A variety of cereals, bread and egg dishes are generally available for breakfast. There will also be plenty of snacks available such as biscuits, chocolate and soft drinks and in some areas you will find fresh fruit in season. You can buy packaged water (bottled mineral water) from local lodge and shop en route or you can also ask your guide to fill your water bottle with boiled water and treat with water purification pills. During the trek, your main luggage will be carried by porter or yaks. Please keep your luggage as light as possible around 12 to 15 kg. You simply carry a day pack with water bottle, camera, sun-screen, spare jacket etc. You can leave your valuable items at your hotel while trekking. Many hotels have a locker system and provide a deposit slip for the valuables kept under the hotel’s safekeeping. On tea house trek you will be accompanied by a team of local crew whose aim is to make the trek as hassle-free and enjoyable as possible. 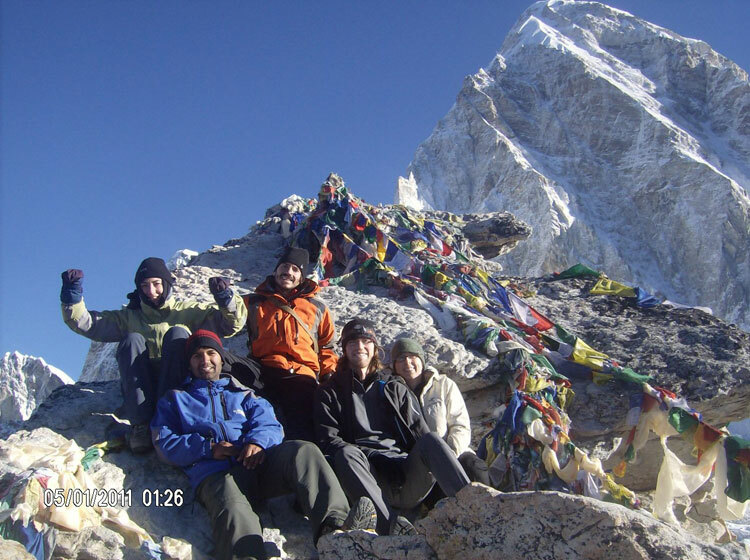 The crew consists of a local leader (Sirdar or Headman) and a team of porters to carry all your gear. On average, there will be a ratio of one porter to every two trekkers. Sirdar speaks reasonable amount of English, good enough to explain you about the places, local culture or any sight that catches your eyes. We bring together a small group of like minded people to give them a memorable and insightful travel experience with an invaluable opportunity to interact with each other in a fun-filled environment. Our travel group generally comprises of maximum 12 members. We need a minimum of 2 participants to run our fixed departure dates. For private trips, no minimum and maximum apply. If you would like to travel independently or with your friends, families and colleagues, you are invited to choose any of the trips at your convenient time frame for any number of people (min 1 max 100 at a time). On this fixed scheduled trek breakfast, lunch and dinner will be provided. You only need money for table drinks (alcoholic/non alcoholic beverages), snacks while walking (a few smaller shops are available along the trail in some areas) tips, souvenirs, hot shower (available in some places). Tips are appreciated by your support team after the trip. The amount depends on your budget and appreciation of their work. As a suggestion, we advise you to allocate 5 – 10% of the total tour cost as tips. The starting point of the trek is in Lukla which is connected by a 45mins flight from Kathmandu. We will arrange the transportation from your hotel to the airport (Kathmandu). On your return to Kathmandu our bus will take you back to your hotel. There are a couple of telephone facilities in the Everest region up to Namche Bazaar. Cell phones work fine up to Tengboche. For trekking in the Everest region, you will need walking boots, sleeping bag (4 seasons), waterproof jacket and trousers, fleece jacket, warm hat and gloves, sunglasses, water bottle, sun cream and day pack. For climbing: down-jacket, plastic boots, crampons, ice-axe, headlight, harness, jumar, carabiners, belay device, prussiks are the main equipments required. A comprehensive list of equipments will be provided once you book your trip. Each morning after packing our bags and having a good breakfast, we set off on the day’s walk. After walking for 3-4 hours we stop for lunch at around midday. The afternoon’s walk is generally shorter and we usually arrive at our destination in time for afternoon tea. The remainder of the afternoon can be spent exploring the village, doing a bit of washing or simply relaxing with a good book. On some days we will arrive at our destination by lunchtime and the entire afternoon will be free. After dinner, the evening will often be spent playing cards and reliving the day’s adventures, before heading off to bed for a well-earned sleep. You need to pass on your International flight details to us for a ‘meeting and greeting’ service at the Airport. You just pass through the Customs and come out of the Terminal building where you will see someone standing with a placard that states either ‘Hiking Himalayas Treks’ or your own name. The best season to trek to the Everest base camp region is autumn (from mid-September till November’s end), and spring (from the beginning of March until mid-May). Temperatures will drop considerably as you trek higher every day. The nights are cold (between -10 C to 5C) but the days are sunny and hot (between 10C to 20C). The mornings are usually clear, with clouds building up during the afternoon, disappearing at night. Trekking during the monsoon and winter is not recommended, as the visibility during monsoon is limited, upper parts and high passes could be covered with snow during winter. March, April, October and November are the most favored months. Let us know the best date that is convenient for you, & we’ll do the rest. Just get friendly with us at: info@hikinghimalayas.com, we’d be glad to help with any queries you have. Recent pictures of Everest Base Camp Trekking. 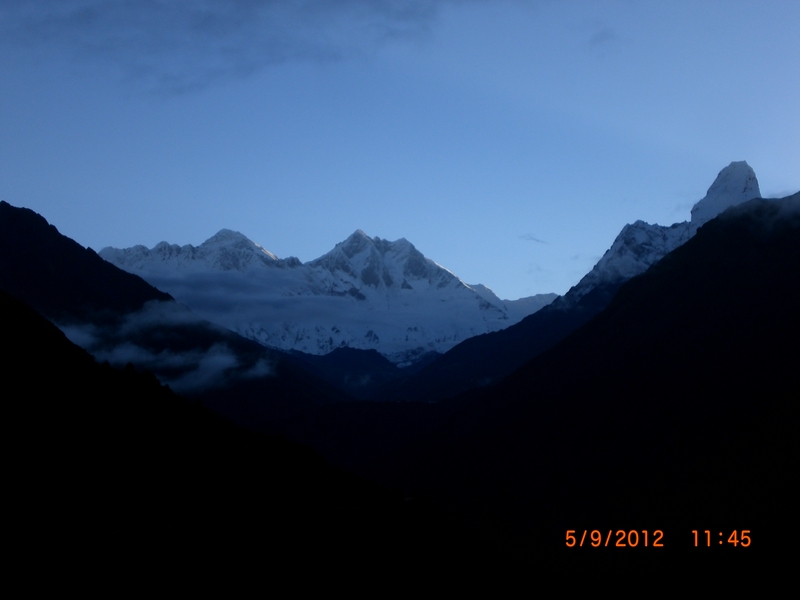 We descend downhill through a forest, cross the Imja Khola and climb steadily to the village of Pangboche. This village is directly opposite Ama Dablam [6,856 m], and has exceptional views of the mountain, with the gompa, Mani walls and scattered pine trees in the foreground. A further two hours walk brings us to Dingbouche. This is a day for rest and acclimatization. We also get to wander up the valley to look at a lake, the Tshola Tsho and the perpendicular walls of Cholatse and Tawache. 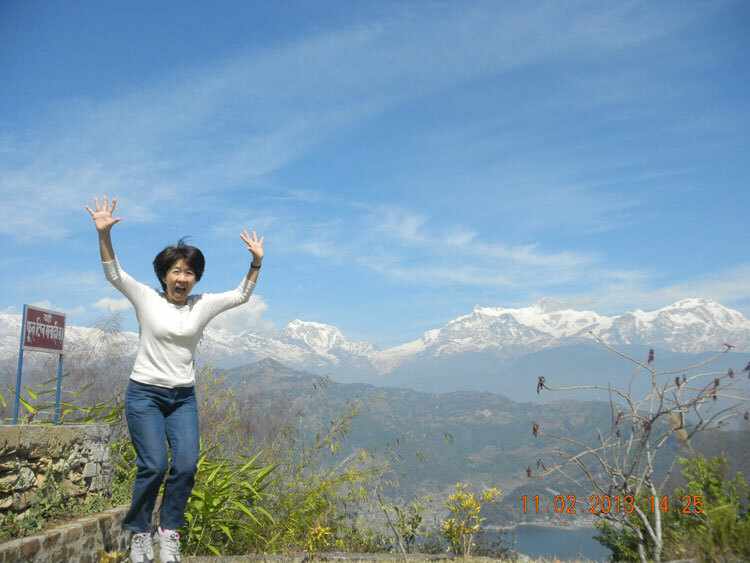 We can climb up 5100m which is called Nagarjuna Hill onto the ridge overlooking ,Great Views of Ama Dablam ,Mt Makalu ,Dingboche for the view of the Imja Valley and the incredible south face of Mt.Lhotse,Island Peak etc…. To reach our next stop, we follow the Khumbu Glacier. The trail offers superb views of the surrounding mountains, especially where the path is forced to rise to cross a tributary glacier. We stop for lunch at our Gorak Shep. Later in the afternoon, we go to Everest Base Camp. It takes 5 hours as the trail weaves its way through ice pinnacles and past the crevasses of the Khumbu Glacier. On the return leg, we can take a higher route to get a spectacular view of the Khumbu icefall and the route to the South Col.
We continue to follow the river and, after crossing it, climb back up through birch and rhododendron forest to Tengboche. Kwangde, Tawache, Everest, Nuptse, Lhotse, Ama Dablam, Kantega and Thamserku are just a few of the Himalayan giants to be seen. From Tengboche we descend to the bridge over the Dudh Kosi. At Phunki Tenga, we get to see the water driven prayer wheels, before making our way back to Kanjuma for the night. We continue down to follow the river and, after crossing it, climb back up & down to the Phakding via Manju,Banker,Toc-Toc. Our final day's trekking follows the Dudh Kosi down to Lukla. This last evening calls for a celebration because this is our last day on these fantastic mountains that were home to us all of these days. We have a party with our Sherpa guides and porters who've got close to us over the weeks & are now good friends. We sample some 'chang' (locally brewed mountain beer) . Altogether, this is an end to a merry trip on a merry note. After supper, we relax under the starry skies on a moonlit night & reflect on the emotional experiences we had while hiking through these massive mountains that have probably helped us re-discover ourselves in ways least expected. We then slumber into blissful sleep. Our Nepalese support team will take you to the airport for your flight home. (Or stay longer for short tours such as game drive at National parks, do some wild-water rafting, a Tibet tour or even mountain biking, etc - please don't hesitate to let us know). We would be glad to help you. Thank you for doing this venture with us & it's been wonderful knowing you over the weeks. Please do stay in touch in the months ahead. Bon Voyage & take care!!! 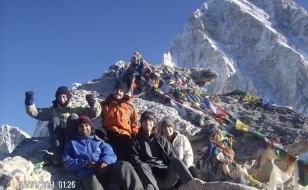 Notes:All the trekking itineraries are flexible and can be revised in order to best meet your requirements i.e. your time, interests etc. Hence, please suggest us your preferences so that we can prepare the program accordingly and quote the price for the same. You are kindly requested to always feel free to contact us for any information that you require. Your queries are always welcomed and we will be privileged to furnish you with the required information.